When it comes to landscaping in a desert climate, you want the desert landscape experts to help you find the best plants for your yard. Here at Stonetree, we have had years of experience to help us know what will flourish, how much water the plants need, and what plant life will complement your home best. We have compiled an extensive list of the plants which we recommend for homes. With each plant, we will list the maintenance requirements, how it handles sun, blossoming times if applicable, water requirements, and the plant’s growth rate. That way you can begin looking for the plants you would like to add to your home’s landscaping. The right decorative plants are the cherry on top of a perfectly landscaped yard. However, many decorative plants are unsuited to thriving in the desert. However, we have found a beautiful variety of plants which do thrive in our desert climate and add considerable beauty to their landscaped surroundings. Many of these plants can work as part of a lush plant design or as bright patches of color surrounded by expertly designed masonry. This bright cactus contrasts nicely in a St. George yard, with its yellow spines emphasized by our red desert soil. Not much bothers this succulent, just be sure to protect it from extreme cold. It is a slow grower, and at full height, it will be 4’ tall by 2½’ in diameter. Generally, the golden barrel cactus won’t reach maturity until it is over a decade old. 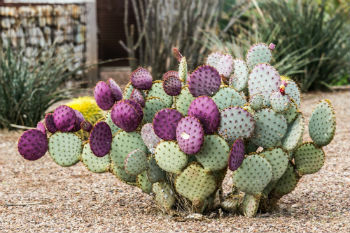 This hardy desert cactus not only puts out prickly pears but also adds color to any landscaping by having the majority of the end segments turn purple. Along with the vivid purple cactus segments, this cactus puts out yellow blooms during the late spring and summer. After it has been properly established, the purple prickly pear needs only occasional watering. Make sure this cactus has room to grow, as it will reach 6’ wide and 4’ in height. 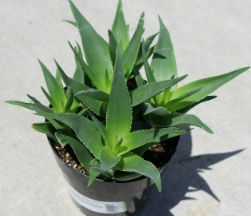 From a small verdant plant, the climbing aloe will quickly grow to its full height, which ranges between 8’-12’tall. Though it is not pictured, the climbing aloe will put out beautiful orange-red blossoms that can attract hummingbirds. 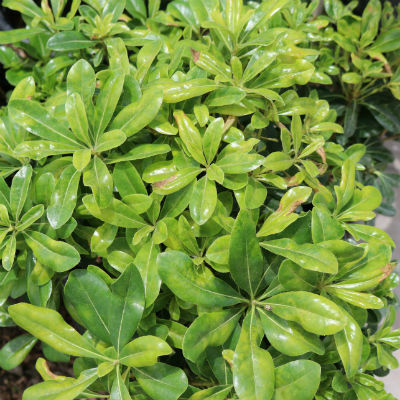 This plant responds well to pruning, so feel free to trim it back when it overgrows its place in your yard. Usually green all over, this charming succulent puts out green blossoms in the spring. Come autumn, the gopher plant’s flowers take on a bright, coppery color. It will grow quickly and as an adult plant, it will measure 2’ tall by 3’ diameter. It is prone to spreading, so be sure to pluck flowers where you don’t want gopher plants to grow. Once the Sedum Touchdown Flame is established, this heat-tolerant plant requires only occasional watering. This plant tends to bloom in yellow clusters, which contrasts nicely with the green and red foliage. At its full growth, this ground covering plant reaches 6”-8” tall and 14”-16” in diameter. When not placed in containers, the Black Hens and Chicks (Sempervivum Black) succulent does best as part of a xeriscape yard. If you don’t have a completely xeriscaped yard, make sure the Black Hens and Chicks are planted in rocky beds for good drainage. These succulents will spread slowly to be about 12” around and 4”-6” tall at maturity, so plan for them to stay relatively small. Also commonly called variegated stonecrop, the Sedum Spurium Tricolor stays low to the ground, reaching only 4”-6” in height. 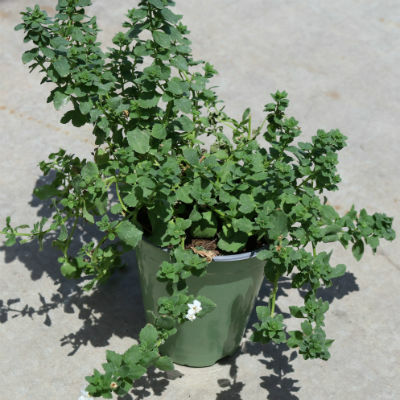 This plant makes good groundcover as it will spread to be 12”-18” in diameter. It is heat-tolerant and does well in a xeriscaped yard. It tends to blossom in clusters, so you have light pink blossoms contrasting nicely with the foliage. 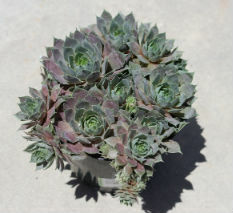 A new Echeveria hybrid, the Echeveria Galaxy Blue is highly drought-resistant and prefers to be placed in rocky soil. 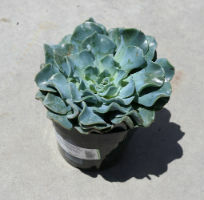 If you decide to xeriscape your yard, the Echeveria Galaxy Blue will make an excellent addition to your landcaping. 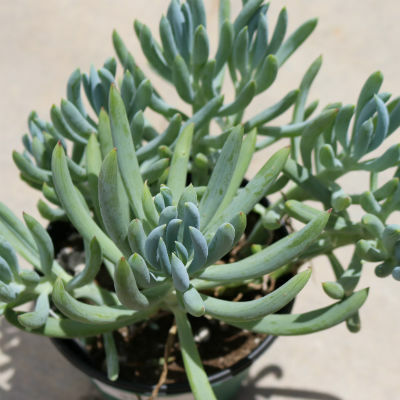 At its mature growth, this succulent will reach around 5” tall and 7” wide, so they can either act as singular patches of color or you can plant them in groups for adequate ground coverage. The edges of the Campfire Jade take on an orange-red color, contrasting beautifully with the inner green leaves In the summer, the white blossoms come in clusters and releases a light, fragrent scent. 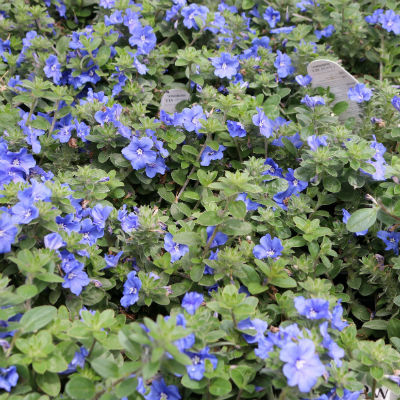 It is excellent for ground cover as it spreads to be 2’-3’ in diameter and 6” tall. A thickly spreading groundcover, the Blue Chalksticks succulents only need occasional watering to keep it healthy. It will spread at a moderate pace, eventually covering 2’-3’ in diameter and reaching around 1’ tall. The foliage also takes on a purple tint during the high heat of summer. 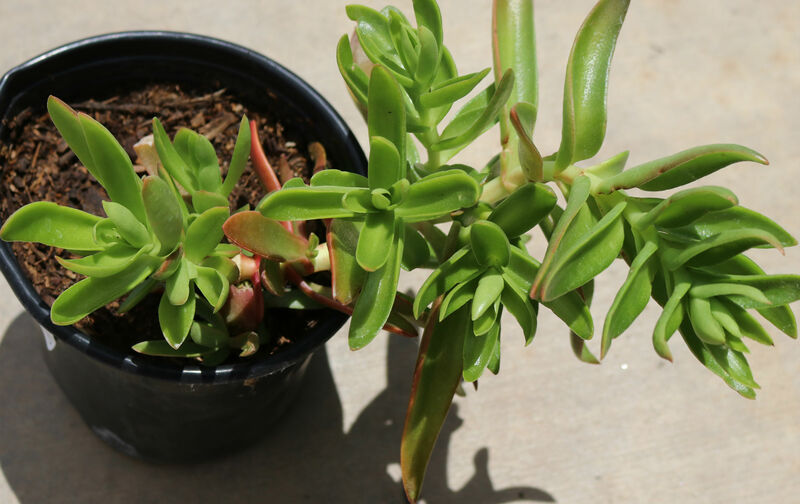 Easy to grow in containers as well as outdoors, the Finger Jade is a succulent which requires more regular watering than some of the succulents we recommend for Southern Utah. At its full growth, this succulent will reach around 4’ tall and 2’-3’ in diameter. A perfect filler for hot Southern Utah yards, the Portulaca Colorblast Double Orange will only reach a height of 4”-6” and 10”-16” in diameter. If you want it to take a particular shape, you will need to trim this succulent, as it has a tendency to trail. 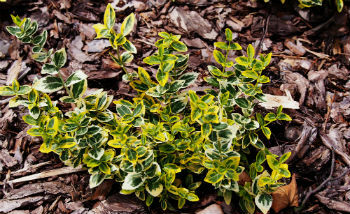 However, this groundcover requires very little maintenance and will thrive in heat with minimal water. You can also find this plant in a variety of colors. 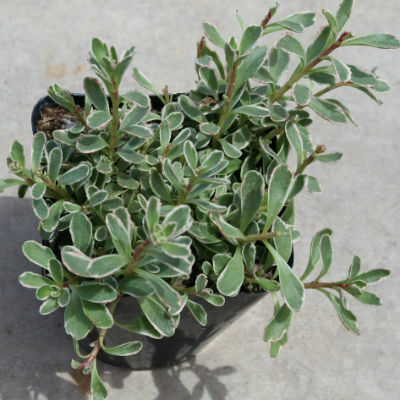 This perennial succulent is an excellent ground cover plant, which will grow quickly to cover the area where planted. It will provide cover in 3’ diameter mats while reaching heights between 6-12”. The small blossoms will close during the night and open in the daylight. You can split the hearts and flower plant and plant the divided plant to expand this plant’s coverage. 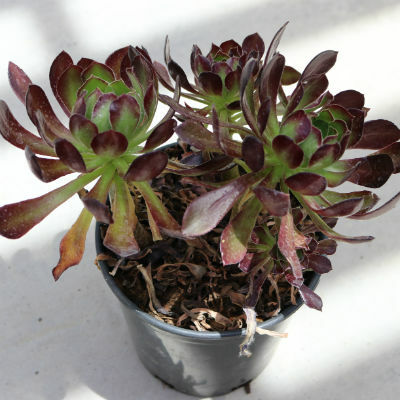 The Black Rose Aeonium is a succulent which grows up into individual stalks which end in the vivid foliage of the green and purple leaves. It is also unique for its yellow winter blossoms, which contrast nicely with the foliage. At their adult size, these succulents reach 1’-3’ in width and height. Also called the ‘Angelface Mix’, you can find this charming annual in a variety of colors. These flowers can attract hummingbirds and butterflies to your yard and can grow to be 10”-12” in diameter and 12”-14” tall. 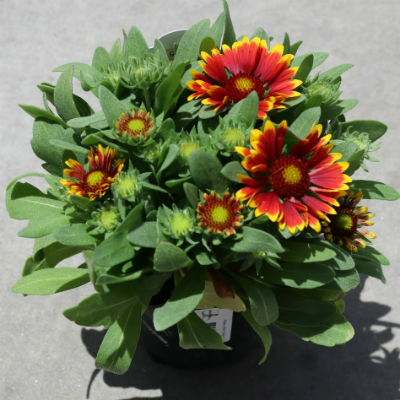 They are great for creating a colorful border to your yard or around your home. Grows into a fairly dense form of groundcover, one Blue Evolvulus will grow at a moderate speed to reach 12” in both diameter and height. You will need to water this decorative plant weekly and more often during high temperatures. Excellent groundcover plant with bright yellow blossoms, the new gold lantana loves the heat of the desert. If unchecked, it can grow to cover 6-8’ in diameter and 2-3’ tall. If you want to restrict the spread of this plant, prune it in the spring. This lovely flowering vine can be either trained to grow upward or act as a groundcover. It will grow quickly with regular watering but needs deep watering for its first growing season. 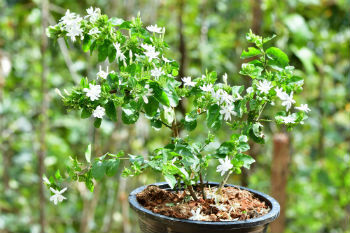 The star jasmine blooms delicate white blossoms with a strong jasmine fragrance. When used as a groundcover, the star jasmine can grow to a height of 1-2’ in height. The vines themselves can expand to cover 18-20’ of space. 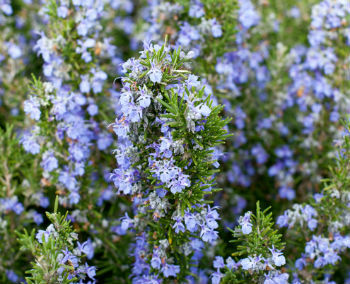 Both a functional and decorative plant, the Tuscan blue rosemary loves full sun and does well as part of a Southern Utah hardscaped yard as well as a more lush landscape. Not only can this plant reach 6’ tall and anywhere from 2-4’ in diameter, but you can use what you prune in your cooking! The blooms are fragrant and attract bees while repelling deer. In the Southern Utah heat, this pretty border plant will need regular weekly watering to stay healthy and vibrant. If placed in partial shade, it can be better protected from the high heat of the day. 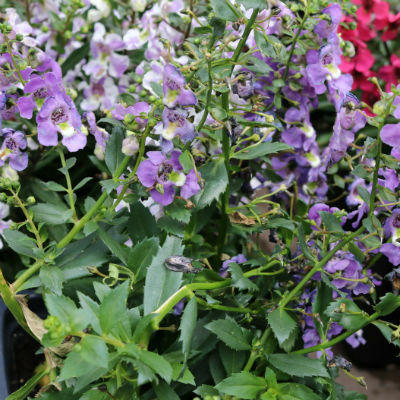 They are a good choice for hanging baskets and containers and can grow up to 8”-12” in diameter and 4”-8” tall. Trimming during the blossoming season and removing dead flowers will allow for a longer blossoming time. 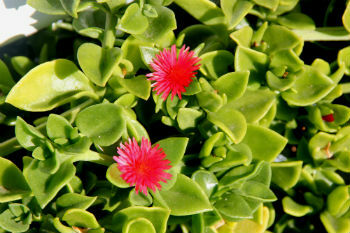 Once fully established, the Hottentot ice plant only needs occasional watering. 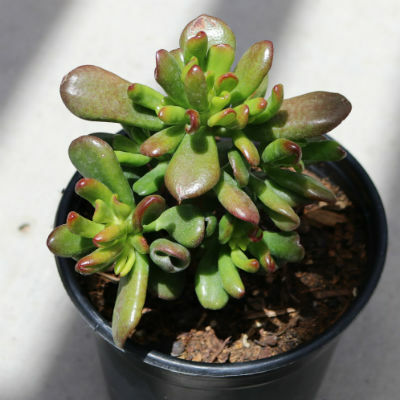 This low-growing succulent can densely cover around 24” and grow between 3-6” high. 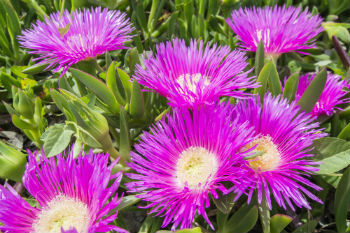 Along with vibrant green of the main plant, the Hottentot ice plant will put out blossoms from late spring until the first frost of the season. 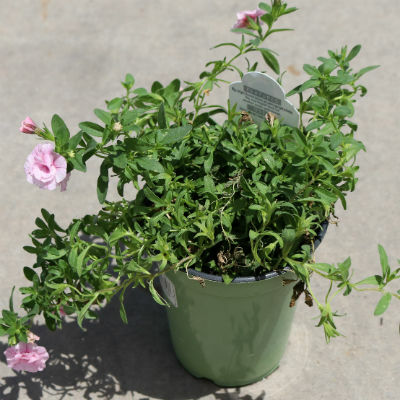 Aside from the occasional watering, this plant requires no help from you if planted in the ground and not a container. This bright plant can act as an excellent ground coverage or yard border plant and is drought-resistant. At its full growth, the Gallardia Aristata reaches a height of 10”-12” and a width of 12”-16”. If you take care to remove dead flowers, you can encourage longer blossoming times. 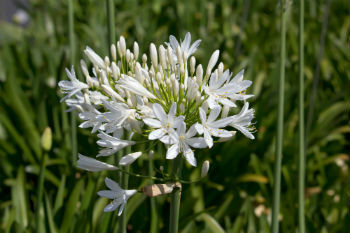 With low, green leaves and tall stemmed flower clusters, the white lily of the Nile flowers are attractive when planted against the home or spaced around the landscaping. The foliage base will grow up to 1½’ tall as well as wide, with the flower-crowned stalks reaching 2½’ tall. These flowers are perennials, so they will return year-after-year. They do require regular watering, though they are mildly drought-tolerant. 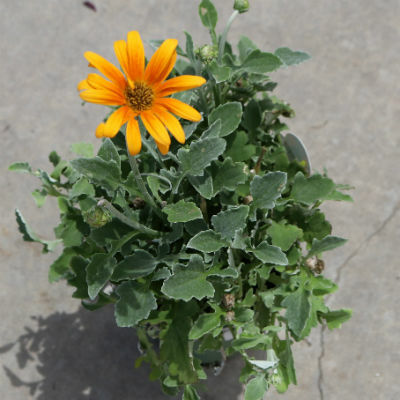 A tough and bright spot of annual color, the Arctotis Opera Fire is heat-tolerant and good with occasional watering once you have established it. It will grow quickly to 12”-16” in diameter and 6”-8” in height. 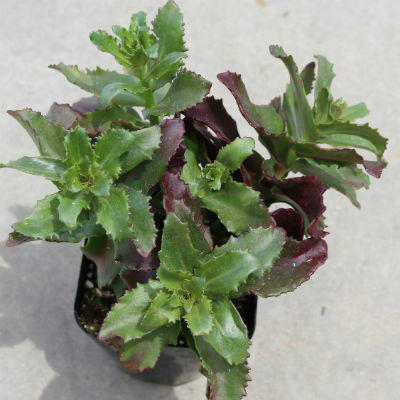 If you have spots in the border of your yard or containers which need a hardy, colorful plant, you may want to consider the Opera Fire or one of the other color variants of this plant. 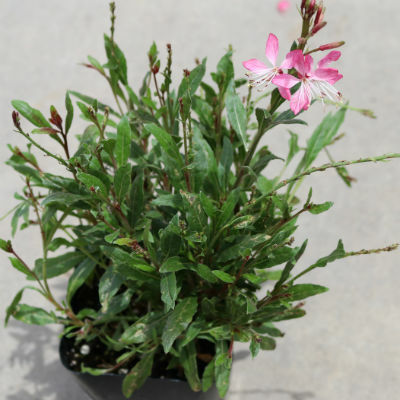 While the Double Compact Pink requires weekly watering, this attractive border plant is heat-tolerant and enjoys being in full sunlight. This plant tends to trail, so if you want it to grow a certain way, you will need to trim it to train it. At its full growth, this pretty plant can reach 6”-10” tall and 12”-16” in diameter. The bi-colored ‘Little Janie’ makes a great border plant but does not grow densely enough to qualify as a hedge. This decorative plant will grow to reach 16”-18” tall and 14”-16” in diameter. Plant several of these heat-loving plants together and you can create a broad, beautiful border for you yard. 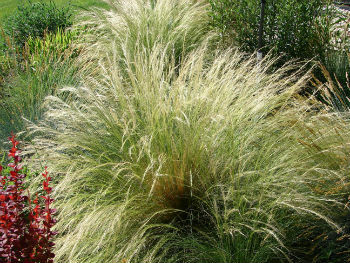 An airy filler for both desert-landscaped yards or more densely planted, the Mexican feather grass can grow between 12-14’ in height and diameter. When the brown tufts bloom, this decorative plant can reach 30’ in height and diameter. 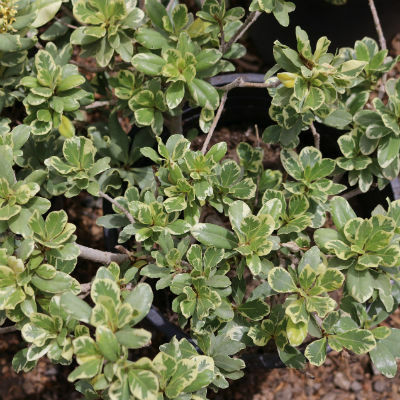 Very little maintenance is required to keep this plant healthy, with occasional watering and minimal pruning in the form of removing dead foliage. 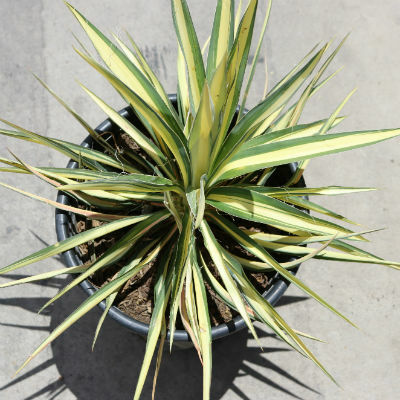 Highly tolerant of heat and drought, the Color Guard Yucca adds bright color to your landscaping with its striped yellow and green foliage. It will grow quickly into its full size, reaching 4’ in diameter and 3’-4’ tall. The white flowers which bloom midsummer create a great contrast and release a pleasant fragrance. You want an attractive, living fence to mark off the boundaries of your yard. Well, you came to the right spot. Peruse through the various shrubs that we have found do very well in our sometimes harsh desert climate. The yellow bird of paradise is a large, open shrub that is well-suited to the heat of the desert. The first growing season it is planted, you will need to water the yellow bird of paradise deeply and regularly. After that first season, you can stick to watering occasionally. At its full growth, it will be between 4-6’ tall and equal in diameter if you let it grow without shaping. For a low hedge, you can choose the Blue Star Juniper. 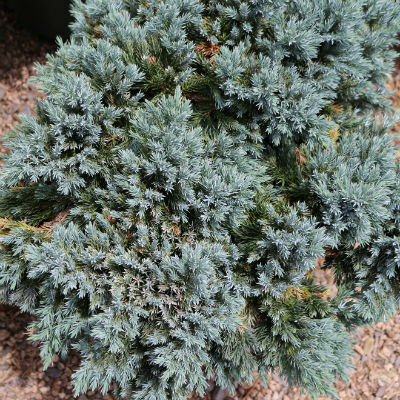 This evergreen conifer will provide year-round color to your yard as it slowly grows to be 2’-3’ tall and 3’-4’ wide. It is low maintenance and easy to shape into your preferred arrangement. In high heat, this ground cover will need more water but it will usually be fine with occasional watering. If you are looking for some hardy green shrubs, then you should consider the nandina gulf stream. These shrubs grow thick and sprout little white flowers in the late spring/early summer. The green leaves turn red in fall. It will take a few years for this shrub to reach maturity, where it will measure 3½’ and 3’ diameter. An attractive and small shrub, the Dwarf Mock Orange will only reach 2’-3’ in height and 4’-5’ in diameter. Little maintenance is required to upkeep this small shrub aside from the need to give it infrequent, deep watering. If the temperatures are high, you may need to water this plant weekly. A variation of the mock orange, the variegated mock orange has yellow-rimmed green foliage, adding extra interest to this low maintenance shrub. Once this shrub has been established, it only needs the occasional deep watering. At its mature size, it can reach 2’-3’ in diameter and 2’-3’ in height. Unlike its variations, the mock orange grows quickly into a large hedge, measuring 6’-8’ tall and 6’ in diameter when it reaches maturity. During its blossoming time, this plant puts out many white and fragrant blossoms. 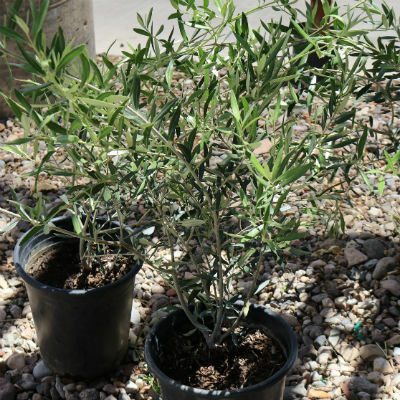 At the peak of the Southern Utah temps, you may need to water this plant weekly. Able to provide bright color all year long, the emerald n gold wintercreeper makes a great low hedge and/or border plant in your landscaping. A single emerald n gold can reach 5’ wide and 2’ tall, expanding by sending out creeping vines. During the spring and summer, the emerald n gold wintercreeper has bright green leaves edged in yellow, which changes to a deep purple edged in reddish-pink come fall and early winter. This can add continual interest to your yard landscaping. Though not typically used as a hedge, the Russian sage is a hardy shrub which adds dense color to any landscaping. It will grow between 3-4’ in both diameter and height. 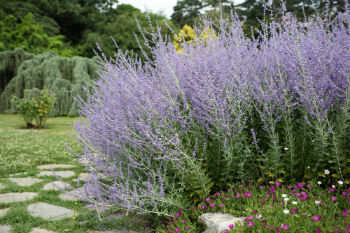 To ensure the Russian sage grows densely, prune this shrub to a couple of inches above the ground in the early spring. The light purple blossoms come in summer and stay until the first frost of fall. This flowering shrub is drought-tolerant and blooms 2” red blossoms in clusters for bright splashes of color. 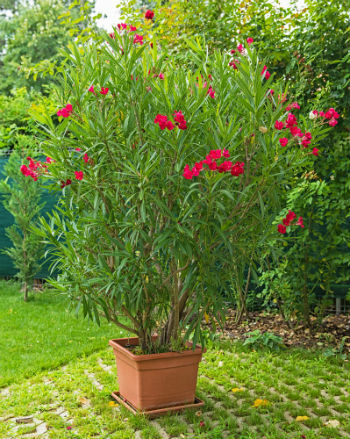 The red oleander can work well in both full sun or partial shade, and can grown 8-12’ in diameter, reaching heights anywhere from 10-20’. Also, as long as the temperature does not drop below 20 degrees Fahrenheit, you will still have foliage on the red oleander throughout the winter. Used as either ground cover or a small shrub, the red clusterberry puts out small pink flowers which are quickly replaced with the bright red berries this shrub is named for, which berries can last through the winter. Once it reaches its full growth, this shrub will be around 3’ tall and 6’ in diameter. 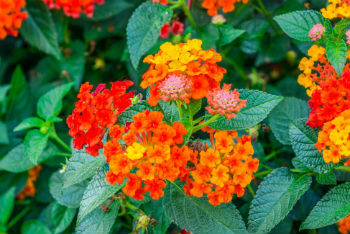 A colorful shrub which will draw birds to your yard and fill in any empty spaces, the Dallas red lantana is a moderate grower. To keep it healthy, you will need to remove dead blossoms periodically as well as shape the shrub in early spring prior to this plant’s bloom. 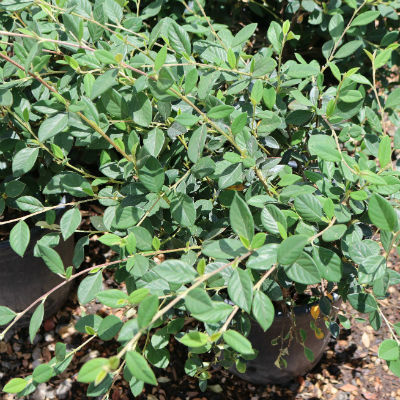 With minimal help, this shrub will reach 4-6’ in diameter and height. 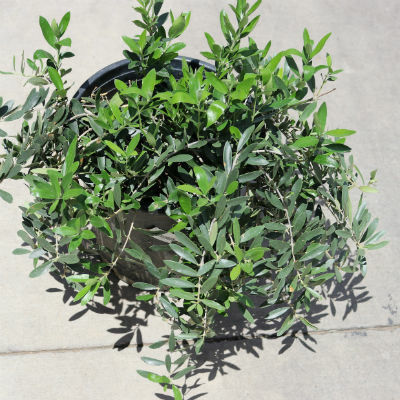 A small, fruitless olive shrub, the Little Ollie Olive can be shaped into a number of forms, from a decorative hedge or a single trunk topiary shrub. It can grow to reach 4’-6’ in both width and height. 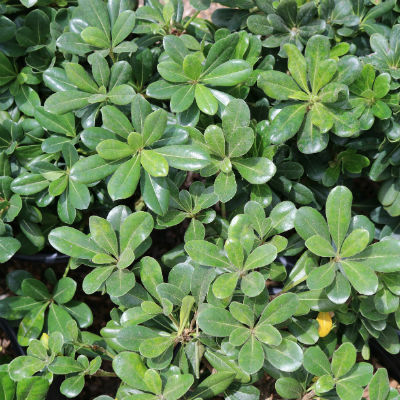 Once you have established this shrub, it only needs occasional watering as it is very heat tolerant. 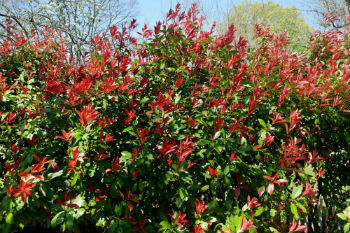 Dramatic color changes happen on the red tip photinia, with the green leaves turning to a bright crimson. 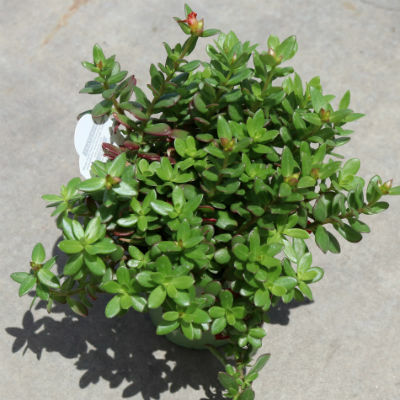 If you allow this shrub to grow out, it will sprout clusters of white flowers which will develop small red fruit. At the height of its growth, the red tip photinia can range between 10-15’ tall and wide. Yes, you can have trees in the desert. It’s not a particularly natural look, especially if you choose to have flowering trees, but there are many varieties of trees which can and will thrive in a desert climate. As far as decorative trees go, the pink dawn chitalpa is an excellent choice to add delicate color to your yard. It will require regular deep watering for its first growing season. Once established, it will still require deep watering, just less frequently. This tree will grow quickly and reach 25’ high and equal in diameter if you allow it. If you want to prune your pink dawn chitalpa, be sure to do it in late winter. This sharp-leafed tree brings a tropical feel to any landscaping. This tree will need deep, regular watering to establish its root system. 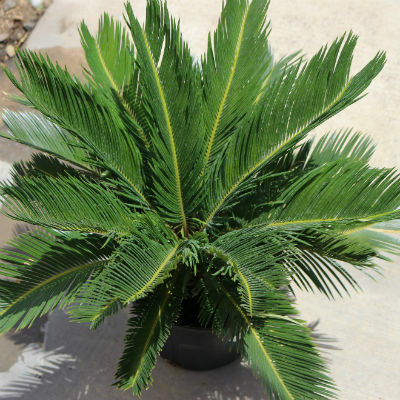 Don’t be fooled by how slow the sego palm grows and plant things close to it. Once it finally reaches maturity, the tree will be around 10’ tall and 8’ in diameter. It will occasionally develop and drop seed cones but does not blossom. To keep the foliage clear of old growth, prune your sego palm in early spring. 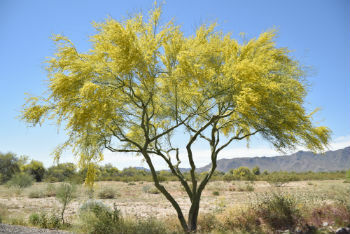 Sun-loving and drought-tolerant, the desert museum palo verde is an excellent choice to add to your home landscaping. It not only provides a good amount of shade but also puts out bright yellow blossoms in the spring, with the possibility of a second round of blossoms in the summer. This tree requires 2-3 days of watering a week during its first growing season but after that, it only needs to be watered once a week at most. The desert museum palo verde can grow to be 25’ in diameter and the same in height. To help shape this tree, be sure to prune after it has flowered and the blossoms begin to drop. While you may never notice the brown turkey fig’s flowers, the large green foliage and brown-purple figs make up for the lack of flowers. You should be able to receive two crops of figs from an established brown turkey fig, especially if you are sure to prune this tree during winter. It will need regular, weekly watering to keep it healthy and producing fruit. At its adult growth, this fig tree will reach anywhere from 15’-25’ tall with its crown matching the height in diameter, depending on your shaping. The eastern redbud tree is one of the first bloomers when spring arrives. This lovely tree puts out pink blossoms which contrast nicely with the green foliage which sprouts after the blossoms have come in. 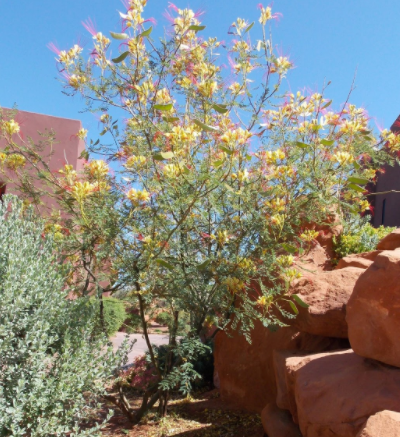 During the heat of a Southern Utah summer, you will need to water this tree a few times a week, rather than the regular once-a-week watering it normally requires. 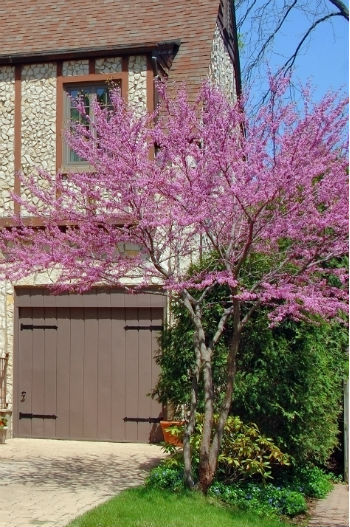 The eastern redbud tree can reach about 30’ tall and 25’-35’ wide. With just a bit of shaping, this tree will form a nice rounded shape. In general, you will not receive fruit from the Wilson Olive, though it may happen occasionally. If you want to prune this tree, it is best done in late winter. Its flowers are small and easily missed, with the main emphasis of this tree being on its foliage. At its mature growth, it will reach 25’-30’ tall, with the crown potentially reaching 30’ in diameter. Once you have established the root system of this tree, you will only need to occasionally give this tree a deep watering soak. 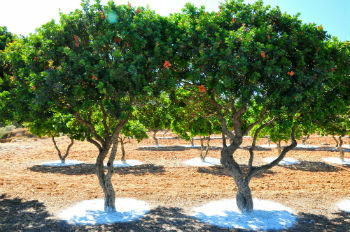 Considered either a large shrub or a small tree, mastic trees add a great degree of privacy to your home. These heat-tolerant trees fill out well, reaching 12’ in height and become 8’ wide. Only moderate shaping is required to make a mastic tree take a rounded shape. This tree’s green-on-green blossoms don’t make much of a splash, but the bright red fruit that becomes black when ripe is sufficiently colorful. 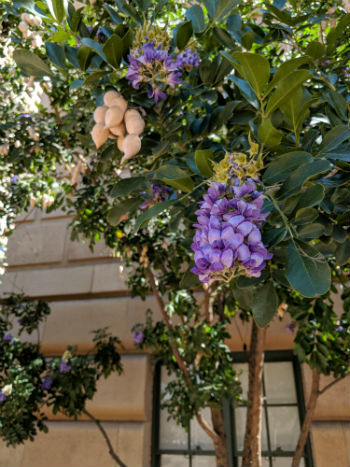 Sweet smelling and small, the Texas mountain laurel will slowly reach its full growth at around 15-20’ tall and around 10-15’ in diameter. The blue/purple blossoms grow in generous clumps, adding high patches of color to the vertical aspect of your landscaping. 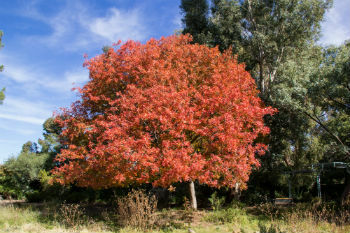 This tree is heat-tolerant and able to withstand droughts well, as long as you water it weekly during times of high heat. Rich green leaves turn to brilliant orange-touched crimson on the Chinese pistache tree. This shade tree can leaf out to 25’-35’ in diameter and anywhere from 25’-40’ high. With minimal pruning done in the late winter, this tree will form a rounded shape. It is drought-tolerant and will fare well in our hot summers as long as you water it a bit more during high heat. 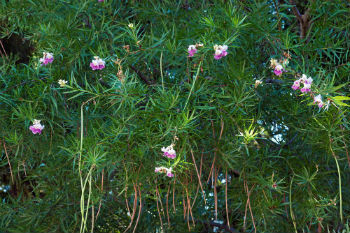 Attract hummingbirds and other flyers to your yard with a desert willow. It will grow at a moderate rate, reaching 15-20’ in both height and diameter. The desert willow sports long seed pods as well as its bright fuchsia blossoms. So, not only will it be a beautiful accent tree but also provide a good deal of shade. 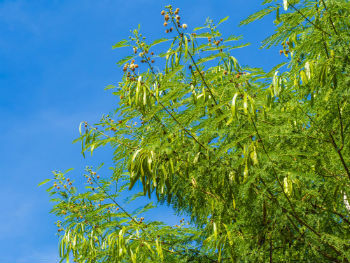 Growing tall and wide, the purple robe locust tree releases a light fragrance during the spring and summer. 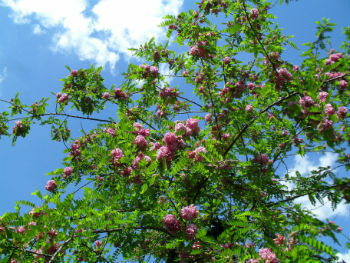 Reaching heights of 30’-40’ and 20’-30’ in diameter, the purple robe locust is not a densely leaved tree. With careful pruning, you can create a denser shape but it will never provide the full shade that other trees can give you. Also, the purple robe locust sports thorns, so use heavy gloves when pruning. Hooked thorns give the catclaw acacia its name, protecting the fuzzy yellow flower and long seed pods this tree sports. The blossoms are fragrant and attractive to honeybees. It will grow to around 12’-20’ in height and diameter and fill out nicely to shade your landscaping. Take care as you prune this tree as the thorns are thick and able to tear cloth easily.